"A reseller is a company or individual that sells to an end-using buyer for a profit, in their own name, as an authorised agent of the retailer." At Voodoo SMS, we see resellers as partners, rather than simply as agents peddling our product. We actively encourage the reseller model as we want as many people using our service as possible. And we give our resellers all the necessary tools to succeed! Voodoo SMS offers you the opportunity to sell bulk SMS at highly competitive prices, backed by our super-duper systems and infrastructure. Operating under your own brand and URL, you will only need to win a customer once and they will continue to use your service month after month loyalty built on the impressive savings and customer service you can offer them. Our bulk SMS solutions are the best in the business, providing excellent revenue streams for resellers. Voodoo SMS is owned and operated by bulk SMS Ltd. We are so proud and passionate about our reseller solution we actually use it ourselves! As a bulk SMS Ltd reseller, you can completely rebrand our platform and solutions as your own, allowing you to build your own brand identity and customer base, and maximising your profits with as little effort and overheads as possible. We guarantee your customers will be impressed with what you deliver through Bulk SMS Limited products, ensuring they remain loyal to your brand. We offer you the best technology at the lowest prices - the perfect combination for your customers. Bulk SMS Limited resellers can offer their customers bespoke SMS solutions, thereby really giving you an edge over your competitors! The best part about becoming a reseller is the flexibility to set your own selling rate, and therefore dictate your own profit margins. This pricing flexibility delivers high levels of income and customer growth, and the more customers you have, the more money you'll make. Since we offer rock-bottom wholesale prices to our resellers, this allows them to be very competitive in the market - even after adding their own profit margin. We also offer our resellers incentives designed to increase their revenue and profits even further. Bulk SMS Limited employs the only the best staff. We don't want to boast, but our team is dedicated, customer-friendly, and experts in what they do! Because we have been involved from the inception of the system (design and development) and now are operating the platform, we are very passionate about the product. As a reseller, you will benefit from our sales, IT and marketing expertise, with regular updates and support at hand. 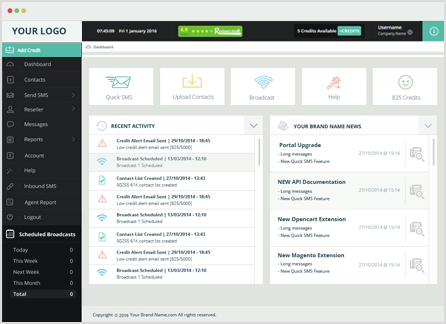 Voodoo SMS as an ever-evolving platform, improved continuously to enhance customer experience. We continue to develop new features and USPs to upgrade our systems and infrastructure. Any system improvements on our platform are automatically built into our reseller platform too, meaning your customers will enjoy the same benefits as our own customers. Our focus on integration and automation increases efficiency, making your life as a reseller more simple and more profitable.